'Yvonne Rainer: Dance Works’ showed the choreographer and dancer’s theoretical and lyrical writing, sketches and scores, photographs of performances, documentary and experimental films and audio recordings. The exhibition we designed with Raven Row, was the first to simultaneously present live performances of Rainer’s dance works and was curated by Catherine Wood, Curator of Contemporary Art and Performance at Tate Modern. 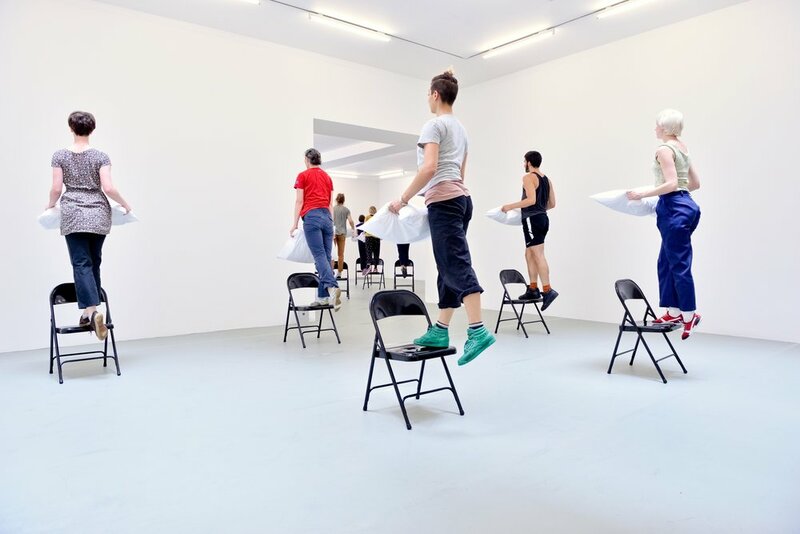 The centrepiece of the exhibition was a 45-minute dance programme performed four times daily on a special dance floor surface installed though out the contemporary galleries. We designed a series of simple larch plank and square section benches for the audience at one end of the gallery, and continued this language through the other elements of furniture within the exhibition, which included a pair of white painted tables square section tables to show archive notebooks, scores, programme notes and letters, beneath perspex with a projector and monitor on top of each showing Rainer’s documentary and experimental films. Along the walls and windows of the second floor galleries we designed 5 long angled display surfaces to exhibit photographs and contact sheets.